Holds contents of a small room or large closet. Perfect for seasonal decorations or yard equipment. Aprox. 50 sq. feet of storage space. Just the right size to hold a bedroom or office. Aprox. 100 sq. feet. Normally will hold contents of three average rooms. Aprox. 150 sq. feet. Can store contents of three bedrooms. Aprox. 200 sq. feet. Holds the contents of five average rooms. Aprox. 250 sq. feet of self storage space. Will hold the contents of a six room house. Aprox. 300 sq. feet. Holds the contents of seven rooms. Aprox. 600 sq. ft. Store extra furniture, boxes, records, etc. A place to park your car or truck. Also just the size for motorcycles, ATV & jet skis. Great size for large cars or trucks. 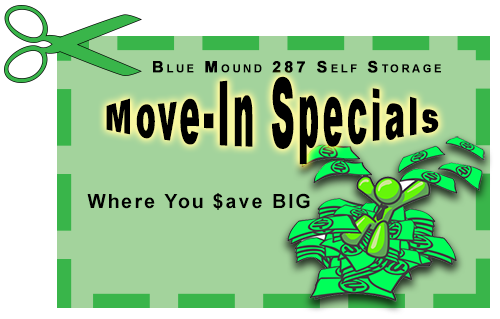 Blue Mound 287 Self Storage is your answer to renting storage space in Blue Mound, Saginaw, Haslet and Fort Worth. Located at 870 Blue Mound Rd West, Ft Worth TX 76052. Ask about our current move in specials. Affordable rates with no contract or lease. Reserve a unit online or call or email for additional information. It is so nice to find a locally owned and operated self storage facility. So tired of dealing with out of state call centers when you rent from a chain. You can’t beat their prices. Economical self storage close to home. Perfect location and easy to get to. We were moving to Haslet and needed to have short term storage. Blue Mound 287 Self Storage was the ideal solution.